To make it big in life it is important that as an individual you are passionate about what you do. Working hard to achieve all your goals, is something very important. Along with being both passionate and hard working, it is important that you are inspired, so that you will be able to move along in the right direction. 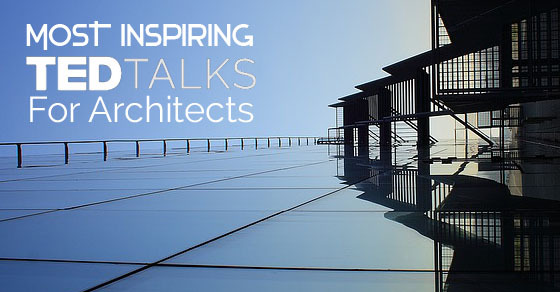 If you are an architect, then given for your benefit are some of the most inspiring ted talks that are bound to inspire you and spur you on to achieve great things in your line. This is indeed an incredibly interesting ted talk, where Architect Carolyn Steel tells us how before there was agriculture, it was impossible for there to be any kinds of permanent settlements. Steel herself is a renowned architect and speaks in depth about how the world in which we reside in is made up and built up from the food which we consume. Along these same lines, she goes on to say that it is very likely indeed that by the year 2050, our population is going to double and that is why she pin points food as an important tool to shape our urban environment in the time to come. In life we will come across many individuals who will try their very best to frustrate as well as tear us down, at such a time it is important that you continue to hold your own and even stand by what it is that you really believe in. Thomas Heatherwick, is one such individual who will never take no for an answer. He makes it a point to not only dream big, but to think of unconventional as well as novel ways to carry out his dreams. His ideas are as outlandish as this – where he takes some apartment buildings and then goes on to create a rain forest between them. Above everything else, when you enter a particular career line, it is important that you ensure that you are willing to really try your best and that you have the ability to think out of the box. Simple theoretical knowledge cannot get any one very far ,especially as an architect. When Alastair Pravin had graduated from his architecture school there were innumerable European architects that were out of business and didn’t know what to do. At such a time what that young man did was that he stopped stressing about what it is that he ‘ought’ to do and started worrying about how he could have practically applied all the things that he managed to learn while he was in school. Thinking out of the box and choosing a path which has never been trod on before, is an option which many of us find hard to pick, this is because we are afraid of failure and we want to move up in life using the tried and tested means of success. What Tim Brown states is that rather than fixating on an object, as an architect, it is important that you consider adopting the approach of design thinking to help you along your way. He even goes on to talk about, how design thinking is an answer to a number of architecture related problems the world over. A world famous architect Iwan Baan, is someone who is on the road practically throughout the year, What he does is that he travels around the world not merely admiring but also documenting architecture, so that he can inspire others to think in a different way as well as show all architects that if you have a vision and have faith in your own vision then you should not let anyone rain on your parade. Innumerable times he has come across human settlements in places which are seemingly uninhabitable and what has made this possible is the ingenuity and far thinking nature of the people. What Skylar Tibbits does is that he invites all the viewers to not only dare to dream but also to come and have a glimpse of the future in the manner in which he envisions it. He goes to great lengths indeed to try and get people to understand how his mind works and the ideas which he wants to put forth. Tibbits is certainly someone who knows what he is talking about as he is a teacher at MIT, a computer scientist, a designer as well an architect. His chief focus is the concept of self assembly which is really cutting edge. The problem of environmental pollution, green house effect as well as global warming is a serious problem indeed and it is the duty of the architects to ensure that when they are designing a building they must keep in mind the environment and how their activities are going to affect the environment. Jessica Green stresses on how it is not all microbes which are bad for us, some are certainly bad, but not all. Her primary focus is how we should make it a point to start deigning for healthy microbial activity and this is indeed very revolutionary thinking. When you are seeking inspiration to help you in your own field it is advisable that you seek the wise councils of people who have been in your shoes before and who know exactly what it is that you are going through, rather than speaking to just any and everyone. When Moshe Safdie speaks, his is the voice of both wisdom and experience. What he does is look back upon the success stories in his lucrative career and ponders over decisions which he has made. He explicates on all those risks that paid off and those which for some reason, didn’t. Housing for Health was a basic environment which was built in order to stop people from getting sick. Paul Pholeros was one of the individuals behind this project and it was primarily to build for a small indigenous community that lived in Australia almost about thirty years ago. What this man does is that he talks about the project in all its minor details and even talks about how it has had a very positive outcome as well. The plan for this initiative was kept very simple indeed so that it could help this community get the most basic of amenities like a place to shower as about 35% of this community did not even have a place to shower. Each and every one of us, choose a particular career based on a number of different things. Some of us want to make a lot of money, whereas on the other hand some people want to acquire a lot of fame. However there are still some noble hearts who want to use their education to give back to the community where they have come from and help others who are less fortunate than they are. Kéré is one such individual who was determined to use his education for building homes for people of his neighborhood and he has even built a primary school for the children as well, out of simple clay. In life we know, that the end is not always the most important and sometimes it is the journey that counts more. Bjarke Ingels is someone who says that as an architect your main focus should not merely be the finished product; rather you should ensure that you carry out every phase of your plan in a proper as well as clear sighted manner. Not everyone has the ability to think uniquely and take an absurd and outlandish idea and to convert it into a reality. To be able to do something like this, takes immense courage. According to the REX and OMA New York Founder, Joshua Prince Ramus, Hyper – rationality is something that is the answer to how a simple graph can turn into a building. It is this very concept of intense rational thinking and absurdity that went into the building of top libraries and theatres in locations across the globe. Technology is something without which none of us can function properly in this day and age. However in order to make the most of all the resources that are available for us we have to ensure that we are responsible and even sensitive to the need of others who may not be as fortunate as we are. In addition to having his own nonprofit organization, Cameron Sinclair is presently working towards creating a network which will be accessible for people across the globe. This is so that people from all walks of life can give their design related ingenious ideas to help those in need. Desertification is a global problem, however in addition to this, it is a major issue especially in Africa. Magnus Larsson has the very ingenious idea for the continent, which will not only be supplied and built primarily by nature, but will also be designed by Mother Nature herself. This idea pertains to building a 6000km wall across the continent so as to prevent desertification for consuming agricultural land. Many people believe that architecture has a lot to do with merely the sense of sight. While this to a large extent is most certainly accurate, yet it is important that architects do make use of their other senses as well so that they can look at any problem holistically rather than merely looking at it from a single perspective. Treasure points out that being deaf and inattentive to the world around you might cost you very heavily indeed, so architects must ensure that they don’t make such errors. Therefore as an architect you can get some much needed inspiration from the above mentioned most popular ted talks. After watching their ted talks video you need not follow all that they are saying, rather you can apply whatever you have learnt in your own work. In addition to this you should be empowered to go ahead and come up with you own ideas. So ensure that before embarking on any kind of ambitious venture, you have all your theoretical knowledge in place and that you have made all your evaluations.